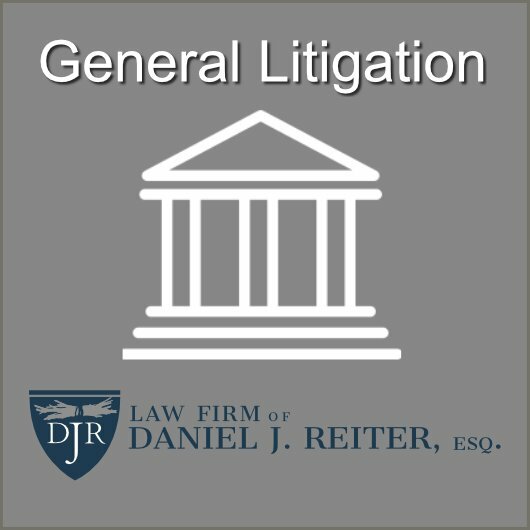 General Litigation and Dispute Resolution Attorney | Daniel J. Reiter, Esq. Daniel J. Reiter, Esq. handles general litigation and dispute resolution matters in state and federal courts, including commercial litigation, real estate litigation and other civil litigation. Mr. Reiter has represented clients in matters regarding breach of contract, partnerships and mergers gone sour, construction disputes, defective products, and corporate litigation. Mr. Reiter has represented clients and handled matters in real estate litigations including foreclosures, partition actions, fraudulent conveyances of deeds, trespass cases, and adverse possession cases. If you or a person in your life has a need for General Litigation or Dispute Resolution, you are encouraged to contact Daniel J. Reiter, Esq. at 646-820-4011 or djr@djrattorney.com.